As much as we like to think that losing data from our iPhone, iPod, or iPad can only happen to someone else, it can and does happen, and you should be prepared and protect your data by backing up your devices as often as you can. The good news is the Apple have made backing up your device very easy. Every time that you plug your device into your computer and iTunes sync’s to your device, it does a backup. The other alternative (only if you are running iOS 5) is to backup using iCloud. You get 5GB of free iCloud storage from Apple, you purchase more space if you need it. For iPhone 3G, 3GS users iTunes sync is your only option. To use the iCloud method you need to enable it on your device first. “Settings > iCloud > Backup & Storage”, it will run on a daily basis when your device is connected to the internet on Wi-Fi, connected to a power source, and the screen is in locked mode. If you use iCloud for backups, the iTunes method will no longer backup your data. It’s either one or the other. Backed-up information using both methods includes purchased music, purchased TV shows, purchased books, and apps; photos and video in the Camera Roll; device settings (for example, Phone Favorites, Wallpaper, and Mail, Contacts, Calendar accounts); app data; Home screen and app organization; Messages (iMessage, SMS, and MMS), ringtones, and more. Probably the largest part of your data that is not backed up is the media files synced from your computer, such as music, video and podcasts, but these can be restored by syncing directly with iTunes on your computer. The best advice is to make sure you sync regularly and your backups are covered. All going well you’ll never need to restore from your precious backups, however if do need to restore Apple makes this easy as well. Just plug your device into your computer and iTunes will start. If your device has been factory reset or is new iTunes will prompt you to restore from your latest backup. If you need to restore from an iCloud backup you have to get your device into a new state, so that you can be presented with the iOS 5 “Setup Assistant”. Then choose “Restore from iCloud Backup”, and enter your iCloud account and password. It will take some time for all your data to be copied from the iCloud servers back to your device. If your device still has data on it and is not in a new factory state, then you can right click (or control click) the device that will be listed in your iTunes side menu, and select “Restore from Backup” from the menu. 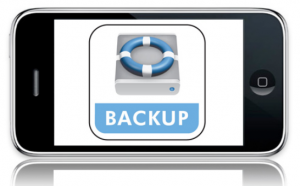 Any backup that is available will be shown to you with the last sync date. This will overwrite what is currently on the device so be sure you want to do this. Once this is done, double check the settings in iTunes for syncing music, podcasts, emails, etc. Then you can sync as you normally do with Itunes to push all your media, music, video, podcasts, etc, back onto the device. That’s it, you have restored your device, and you are back in business. This entry was posted in How To's, iPad, iPhone, iPod and tagged backup, iPad, iPhone, iPod, restore. Bookmark the permalink.